Lettuce is a cool-weather vegetable, able to grow early in spring and into winter, depending on the variety. Lettuce growth is stunted during summer. 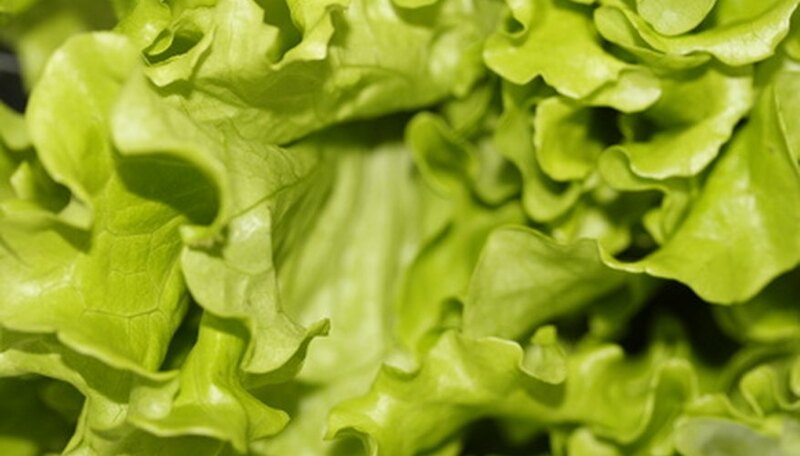 Lettuce comes in leaf variety, cos or romaine, crisphead, butterhead and stem according to the University of Illinois. To extend the growing season, lettuce seed requires germination indoors before transplanting to a larger pot or into the garden. Seeding directly into the garden is the easiest method, however, and is relatively simple to do. Prepare the soil by removing large stones or debris and mixing in three to four inches of organic material with a rototiller. Till the soil to a depth of six to eight inches. Make rows using the edge of a hoe, spacing the rows 12 to 15 inches apart for leaf varieties and 24 inches for other varieties, says Ohio State University. Dig the rows to a depth of a 1/4 to 1/2 inch. Place seeds into the rows at a rate of 10 seeds per foot covering the seeds with a 1/4 to 1/2 an inch of soil, says the University of Illinois Extension. Water the area thoroughly, slowly to not wash the seeds away. Allow the seed five to 10 days for germination. Thin the seedlings so that they are four inches apart for leaf lettuce, and six to eight inches for other varieties. Fill a seed tray with nutrient-rich soil specific for growing vegetables until it is almost to the top of the tray's rim. Sprinkle the lettuce seeds on top of the soil, trying not to layer them over each other. Sprinkle another layer of soil on top, patting it down slightly with your fingers. The point is to not bury them, but to keep them protected between two light fluffy layers of soil. Use a spray bottle to moisten the soil and the seeds. You will probably see germination in about a week if the soil temperature is around 50 degrees. Put the seed trays in a sunny location, indoors or outdoors, for at least six hours of direct sunlight per day. Spray the soil daily with water while the plants germinate and begin to grow. Thin the seedlings to allow about 6 inches between each lettuce plant. Select a container large enough to grow the type and amount of lettuce you want. The seed packet suggests required distance between plants. Loose-leaf lettuces can be a little crowded in a container. Fill the container with organic potting soil, leaving 2 inches at the top. Place lettuce seeds on top of the soil. Distribute them in the container and thin the plants after they sprout. Cover the seeds with additional soil and water, gently using a spray nozzle. In cold winter areas, start the seeds indoors in a sunny spot and move the plants outdoors when the danger of frost is past. Water daily while the seeds germinate and sprout (about five days). Thin the plants when they are 2 inches tall. Leave the healthiest and remove enough to give the plants room to grow. Water daily and check for bugs. Harvest leaf lettuces before they go to seed. You can harvest the young leaves as the plants are growing. Head lettuces will form a solid head as they grow. Harvest these lettuces when the head is fully developed. Plant your lettuce seeds in soil containing a good amount of nitrogen. You can amend your soil with a nitrogen-based fertilizer if necessary. Sow the lettuce seeds approximately four weeks before the last expected frost. This is when the soil is pliable enough to be worked. Plant your lettuce seeds in groups of three or four seeds one-eight to one-half of an inch deep. Space the seeds six inches apart in rows that are six inches to one foot apart. Cover the seeds with fine, loose soil and press down. Keep the soil moist until the seeds sprout. Locate your early spring plantings in full sunlight. In summer, plant your lettuce seeds in partial shade. Sow your lettuce seeds every three weeks instead of one large planting. This will ensure a continuous crop all summer long. Thin out your lettuce to ensure that the plants remain at least six inches apart in all directions. Leaf lettuce commonly goes into the garden as soon as the soil can be worked in the spring. Plant seeds in a single traditional row or broadcast the seeds over a wide row about 1 foot wide. Cover the seeds with about 1/4-inch of soil. Even if the garden is hit with a mild frost, warmer than 28 degrees Fahrenheit, leaf lettuce will grow. Head lettuce has a longer growing season and may require starting in a greenhouse or hot house. In these cases, start the plants about six weeks before the planned start of outdoor growing. Another option is to purchase started plants from a nursery. Lettuce thrives in temperatures between 45 and 65 degrees. Early planting extends the growth period before it gets too warm for lettuce. Plant lettuce in the fall if your area has a long enough period of these types of temperatures for the lettuce to mature to a harvestable state. Lettuce grown in pots or containers can be planted even earlier than garden lettuce. While the plant tolerates mild frost, the containers can be brought inside avoiding the stress of cold overnight or extended cold temperatures. Two plants are commonly grown in a 1-gallon pot. Partition off a section of the pond for the water lettuce, as water lettuce prefers crowding. Use clear plastic mesh formed into a cylinder or a floating hoop to create the water lettuce section. Float the plants inside the mesh or plastic hoop. Set the plants so the feathery roots trail under the water and the rosette of leaves floats on top of the water. Insert enough plants inside the hoop so they float freely but the leaves touch each other. Fill a bucket with water to fertilize the lettuce in midsummer. Add a soluble pond fertilizer to the bucket of water at the rate recommended on the label. Remove the lettuce from the pond and float the plants in the bucket of water for 24 hours to fertilize them. Repeat the fertilization procedure six weeks later. Bring water lettuce indoors for winter, as they can't tolerate frost. Float the plants in a bucket of water in a warm room where they receive six hours of bright sunlight. Alternatively, set a grow light 6 inches above the plants and leave it on for 10 to 12 hours a day.